I don’t need to tell you what happened on the 15th of April 1989. I don’t need to provide some gushing, pithy one-line eulogy. You all know it, and I’m not the one to tell you about it. I suggest looking in on the Inquest and seeing the families of the ones we called “the 96” describe each one in detail. They loved our game. Their families loved them. And no doubt every Evertonian will mark 25 years from that terrible day with thoughtful respect to the club that lost 96 of its own. In fact, more than that. The game that lost 96 more when it shouldn’t have. See, life dishes out plenty of despair but also moments of true euphoria. That was one of them on Sunday. It all seems like a dream. The biggest win over Arsenal since 1989, the beautiful passages of play, Santi Cazorla throwing his arms up in the air with disgust as a side that cost less than Mesut Ozil – albeit the injured Mesut Ozil – simply waltzed around him. From start to finish it was a tactical masterclass. Romelu Lukaku went out to the right, Mirallas to the left. While attacking Monreal and Sagna was a part of that, the real enabler was Steven Naismith. Darting into gaps between Mertesacker and Vermaelen, he led the two on a merry dance that left at least one out of position. With the defence riled, Naismith would move towards the ball, taking Vermaelen with him, and the Belgians would attack the gap in behind with aplomb. The tireless Scot would hit the penalty area as quickly as possible and the first goal showed both his vision and ability to find space amongst the chaos of the Arsenal defence. That’s why he was Man of the Match. And for the finger wag celebration. Naughtiest false nine around, him. It was just one of those days. Kevin Mirallas turned Sagna, plodded into his own penalty area and passed the ball to Giroud. “There y’are lad, have a goal on us.” And Tim Howard smothered it. Probably because Giroud’s a melon. In fact, I called him a melon and there was no retrospective curse where he notched a brace and some “GOONER4LYF” on Twitter didn’t get onto me about it. Days like those convince you that nothing but the best really is good enough, and that there’s all sorts this Everton side can do. Writing this while listening to Stairway to Heaven has made me feel like drifting a cloud of pure Everton. It was bliss. Anyway, now War Pigs has come on so it’s time to wreak hell. Sunderland, Crystal Palace, Manchester United, Southampton, Manchester City, Hull City. This lot stand between us and fourth place. Six wins out of six confirms it, as five wins and a draw would unless Arsenal go on an unprecedented run of batterings. In their favour this time. From there any points they drop come as a bonus and a breathing space. So should we be scared of this lot? Crystal Palace have survived with some comfort (kudos) and are terrible on the road. We know what happened the last two times Moyes met Martinez. Southampton’s season is over and half the squad are tiptoeing about trying not to get injured. Man City is an obvious challenge, but they love coming to Goodison don’t they. Jan Mucha was in goal and we won 2-0. Just digest that one. Hull City will have nothing to play for on the final day and may even have an FA Cup final to think about…the jammy sods. Yes, that’s over-simplifying it terribly. They’re all Premier League quality teams who will put out eleven men who will try to stop us in our tracks. Premier League quality…ah, that’s right. I didn’t mention Sunderland, did I? Oh boy, Sunderland. You’re going down. Again. Their fans must get motion sickness from all the moving about their club does. You’ve got one boss in, one boss out, one boss in and you shake the backroom staff about. Have Borini up front and you’re going down, that’s what it’s all about. The club has paid the price for sacking Peter Reid for a long time. That’s right, you don’t mess with Reidy. 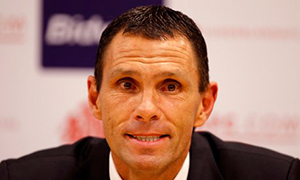 Gus Poyet promised to bring stability after Paolo di Canio, but that’s a bit rich. Yeah, that’s right Germany, that Weimar Republic was blag, wasn’t it. Nice Herr Hitler will calm it all down for you. As a result they’ve done some things that mean they must go down. Conceding five against Spurs. Allowing Lee Cattermole to work as a professional footballer in the Premier League. And beating us at home. Makes me want to roar with anger and a tinge of self-regret, making it tail off weakly into a saddened groan. Yep, I did that. One mistake somehow cost for more than an entire ninety minutes of pressure. Whatever, it’s time for revenge. You’re gonna love this Martin Samuel, because this is the LOAN DERBY, isn’t it. LOANS. Horrible things. Public libraries, Blockbusters, Avis car hire. Your boys have taken a hell of a beating! A hell of a beating. So in goal for Sunderland is Vito Mannone, another of those Arsenal keepers who was never going to be quality but did well elsewhere. Trust us to get Richard Wright from them. In defence, Bardsley, Brown, Cuellar and Alonso. *MWAAAHHH. LOAN KLAXON. UNCLEAN, UNCLEAN*. Oh, and Vergini. MWAH. Cattermole, Johnson, Ki. MWAAHHHH. Bridcutt. Borini. MWAAAAH, DIRTY LOAN B******S.
Actually, there’s a few decent players there. Adam Johnson provides a bit of a threat, while Ki is a smooth operator in the midfield. Apart from that there’s a defence that crumbles faster than Oscar Pistorius’ defence and an attack that actually could do with Michael Bridges. Imagine. Sorry lads, he retired. This is always the part where I’d go “should beat them…but we’re Everton, aren’t we.” That sentence doesn’t make sense now. So how about “We’ll batter them, these are s*** these. EVERTON, AREN’T WE?” Magnificent. 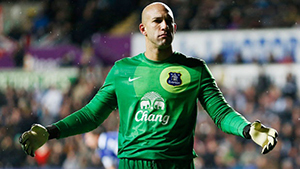 Tim Howard might have something to do this week – you never know. Seamus Coleman’s preparing the double Zidane turn bicycle Rabona goal he’s clearly going to wow us with next, so he’s on the right. John Stones and Sylvain Distin are just solid. Nuff said. Leighton Baines has got the snarl back, which was great to see, and he will hit the left flank with zeal. Pipe down Johnson. Gareth Barry (MWAAAH, MWAAAH) and James McCarthy will be looking to attack a pretty ropey Sunderland line-up, with Mirallas, Lukaku and Barkley ahead of them I should imagine. Naismith up top. Why change a winning team? Alright, Osman’s benched, but he’ll have to get on before Bill Kenwright gets hold of him, puts him in a tent and charges us a fiver to see the incredible Elephant Man. Deulofeu and McGeady could easily start as well. It’s a flexible side. That osman/elephant man joke made me spit out my coffee in the train station. Cheers. We’ve just been laughing at all the feedback on your forum. As some of you may or may not have worked out, this article is dated 10th April. PreviousWe Loan Who We Want NextWhere’s That Glass Ceiling?